Has any one noticed I’m a DADDY’S GIRL?! Oh yes! I am a DADDY’S GIRL and I’m so happy about this. My daddy isn’t like most of the other “daddies”, he is involved in every single thing we do (Although he knows I’m a big girl now and gives me my space) . 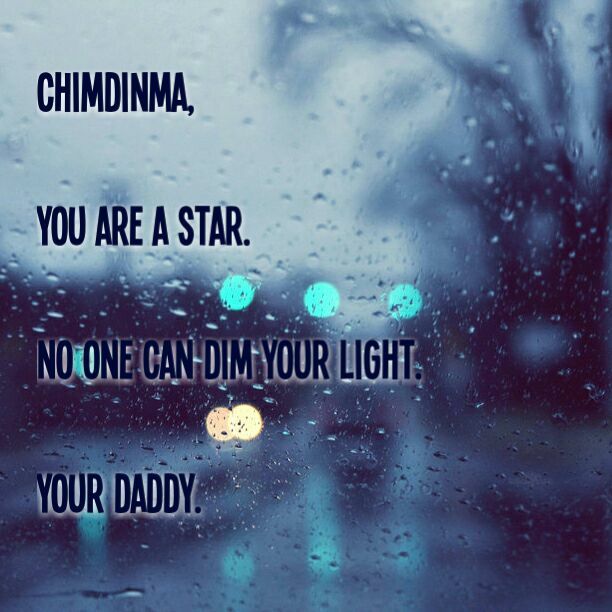 “CHIMDINMA, YOU ARE A STAR. When someone believes in you just know that you’ve already gotten half of the work done. The smile on my face was so WIDE though and I’ve decided to share this inspiring “quote” with you all. From now on say to yourself : (YOUR NAME) I AM A STAR. If possible, send this your kids, your friends, your loved ones. You never know who might just be needing that word of encouragement. Do not let situations, circumstances, trials and tribulations dim your light. It’s not going to be easy but what I know for sure is this ; YOU ARE A STAR AND NO ONE, NOTHING, CAN DIM YOUR LIGHT(S) !!! It doesn’t matter how long it takes, as long as you keep trying and believing you will shine. Let the whole world see your light.